As I’ve mentioned before, having actual physics (with gravity and friction and collisions and stuff) in a virtual world (especially one with dynamic and unpredictable content) is really hard, and Second Life has compromised by having just enough physics to make some common things (falling, driving vehicles) work well enough to make us happy, and leaving much of the rest of the physics pretty strange and random. So except for AVs and vehicles and a couple of other narrow examples, very little of what we see in SL is actually subject to physical law. It occurred to me the other day that one fun physical thing to make would be a simple chain. So I did. The top chain in the picture is nonphysical, so it stays just where it’s put, floating there. The other four are physical, and they swing freely. It is sitting down below my sky-laboratory, right next to the 100m flagpole that leads up to it, hovering motionless in the air, and no longer physical. Don’t know how it managed to get detached, or what could have turned off the physical bit. I continued hunting, and two of the others were also non-physical and also in midair, somewhat lower down, apparently embedded in a neighbor’s banline wall. I eventually found the last one, maybe 100m away horizontally, lying on the ground on someone else’s parcel, still physical. I have nothing very profound to say about this, except that one should obviously not expect things held together by mere physics to stay together, even if they are (for instance) a set of linked solid rings. I don’t know how long it took them to uncouple, or what did it. They were as far as I know not subject to wind pressure, nor were they set to “allow anyone to move” which might have allowed a passerby to give a good stiff yank. Although I suppose someone simply flying into them at high speed could have imparted enough energy to defeat physics engine and unlink the rings. Note that it’s a rather flat pile, and most especially note that some (many) of the blocks are sort of floating in midair. This isn’t an action shot of the pile collapsing, catching cubes as they bounce around or anything like that; this is the static state of the pile after I turned off the dropper. So the floating is a tad unexpected. It turns out that the SL physics engine is quite approximate. When figuring out physical interactions, it will get things more or less accurate to the tenth of a meter, but not any finer than that. 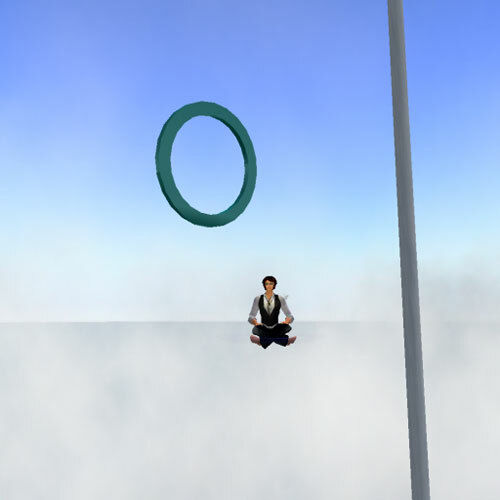 Meaning that a physical decimeter cube may act as though it’s anywhere up to twice as big as it is; in this case by hovering suspended in the air, because the physics engine thinks that it’s resting on the ones below it, or close enough anyway. 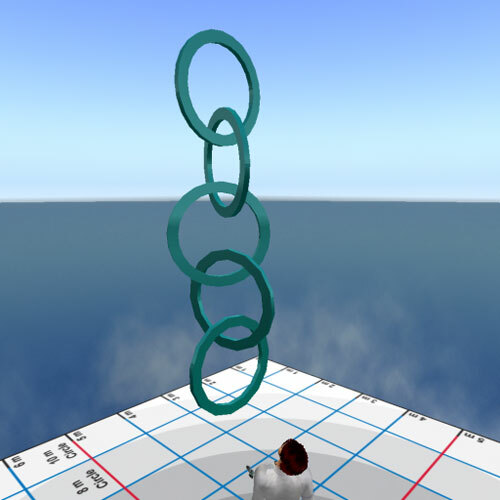 SL physics is wonky in a number of other ways, due to this and other approximations. (For instance if you slam a physical object into a wall fast enough, it will pass right through a good fraction of the time.) Why don’t we Residents notice this more? Two reasons occur to me. 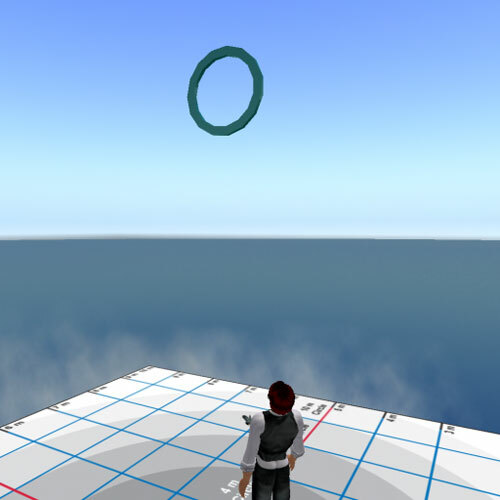 First, the vast (vast) majority of things in SL (AVs not included) aren’t physical! 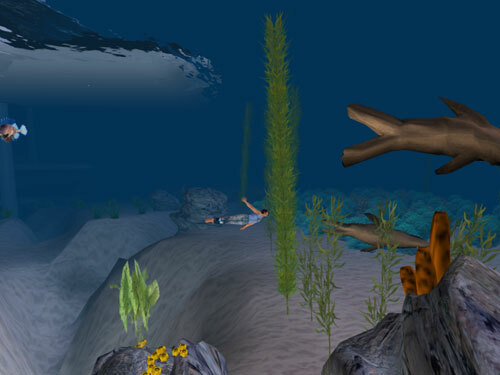 Prims are subject to the full laws of physics (such as they are) only if a particular box in the editing control is checked. 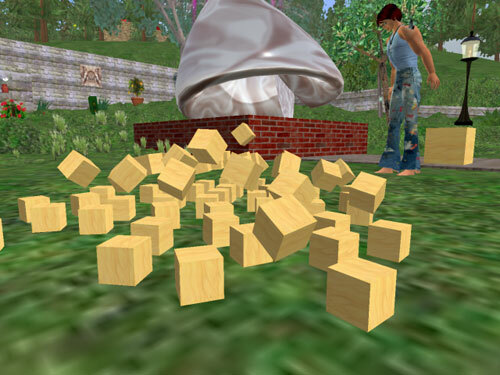 And prims with that box checked are always falling over or sliding away or generally misbehaving, so creators don’t check that box without good reason. Prims without that box checked are non-physical, and stay wherever the heck they’re put (which is why my sandpile maker can just sit there in midair, and why we think nothing of seeing an informational sign sitting placidly half a meter off the ground with no visible support, and why skyboxes don’t need expensive anti-gravity generators). Non-physical prims do serve the useful purpose of blocking vision (unless they’re transparent) and blocking the motion of AVs and physical objects (unless they’re phantom), but mostly the laws of physics ignore them. They can interpenetrate each other, sit in midair without support, never fall over on their own, etc. Second, the most common physical objects that we do encounter are vehicles. Boats and cars and motorcycles and balloons and so on are usually physical, but they’re a rather special kind of physical object governed by one or more scripts that use the special vehicle-related scripting verbs. These verbs are designed specifically for the special case of vehicles, and they go some ways toward hiding the wonkiness of the underlying physics by making specifically vehicle-like operations work more or less as expected (sometimes definitely less, as anyone who’s done much vehicle driving knows). Why is the physics engine wonky in this way, so that we have to be protected by living in a largely non-physics world where most of the physical things that we use are specially scripted to be vehicles? Why not just have a consistent laws of physics that everything obeys? The answer is that simulating physics is really really hard. The RL universe cheats by using massively parallel hardware; LL can’t afford that kind of compute power. Some other virtual worlds (WoW, Lively) have no notion of physics at all as far as I can tell, except in the degenerate sense that stuff stays where it’s put. It’ll be interesting to see how this aspect of VWs plays out in the future. Will we see VWs with more and more powerful and “realistic” (or creatively unrealistic) physics engines, and will the laws of physics come to govern more of the virtual stuff that we work with? Or will this kind of physics remain a sort of a curiosity, turnable on for special cases (like vehicles or cannonballs), but off most of the time, because the physics that we really want in our VWs is a simple physics where things stay pretty much wherever they’re put?